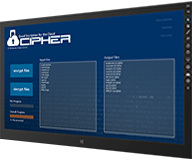 Cipher - Top Security App for Windows 8! Cipher is one of the strongest file encryption/decryption tools available anywhere. Using several encryption algorithms and techniques, it encrypts each file 4-times, each time using a progressively more complex algorithm for each pass. The password or phrase used to encrypt the file is never stored or saved anywhere, thereby eliminating the possibility of compromising your data by hacking your password. Cipher uses only the most sophisticated and complex encryption algorithm available in the industry. Your data is stored in a proprietary format that only another user of Cipher could decrypt, and only if authorized by you. With Cipher, you can choose a single file, or multiple files for an encryption or decryption session. You can also archive all of your encrypted files into a single “Zip” file for convenience. Any type of file can be encrypted with Cipher: images, binary data of any size, video files, documents and even compressed data files. After encryption, the resulting file is as secure as technology will allow. You can save the file anywhere on your computer, secure with the knowledge that your data is beyond compromise. Cipher – when it absolutely, positively has to be secure.